Great starts lead to fantastic finishes! Have fun teaching your dog and watching him grow as a loyal, well behaved companion. 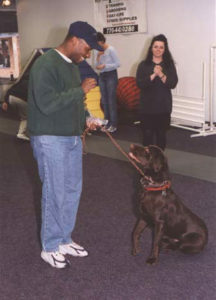 Skills taught: Understanding general methods and theories of how to motivate and train your dog, Handling techniques, Equipment recommendations, Confidence, Socialization, Leadership, The commands Watch, Come, Sit, Down, Stay, Walk, and Heel on leash. Includes Q & A time dedicated toward discussing household manners and behavioral issues. Yet, please note that the focus of the class is primarily basic obedience. Consequently, if a household or behavioral issue is inordinately vexing, severe, or complex, we highly recommend the purchase of an in-home private lesson to supplement the class. In-home private lessons are more detailed, vivid, and effective when addressing household and behavioral issues. $210 at all CPT locations. 8 one-hour weekly meetings. Heather and Abby attentively listening to their CPT trainer. Dennis and Rambo practicing the “watch” command. Click here to see a video of CPT Trainer Patricia King working with Mason, a 1.25- year old Golden Retriever, during a later phase of Mason’s 21-day Board Train. In this video, Patricia transitions Mason’s heeling from on-leash to off-leash and introduces the stand command. Notice how well Mason performs when learning via positive reinforcement. CPT incorporates the latest advances in canine learning theory and behavioral psychology! CPT Trainer Mark Spivak working with his personal dog Marlo, a 17-month old German Shepherd Dog. In this video, Mark demonstrates Marlo’s off-leash heeling skills. Notice Marlo’s attention, speed, and enthusiasm!